Francesca Pardi talking about her degenerate children's book, Piccolo Uovo. 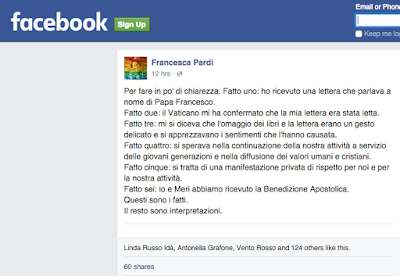 Francesca's post in Italian earlier today on facebook, clarifying just what happened. 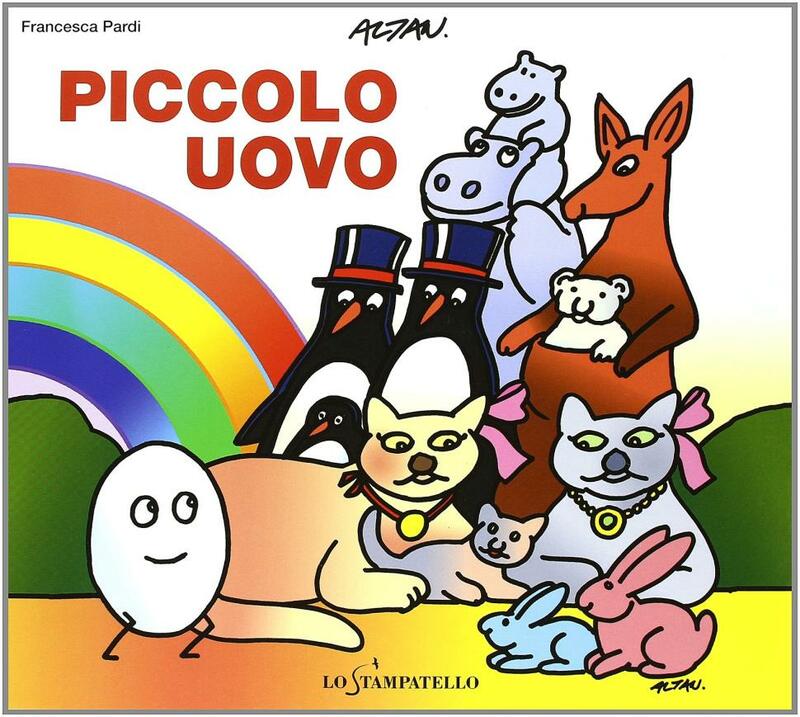 Francesca's post translated into English by translate.google. That's over 1 million less people per year than came to see Benedict XVI at his general audiences! 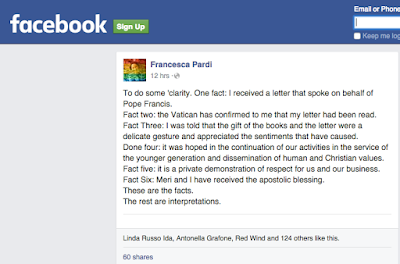 In June, Pardi sent a letter to the Pope about the discrimination she’s experienced, along with a package of several LGBT-themed books from her publisher, The Guardian reported this week. 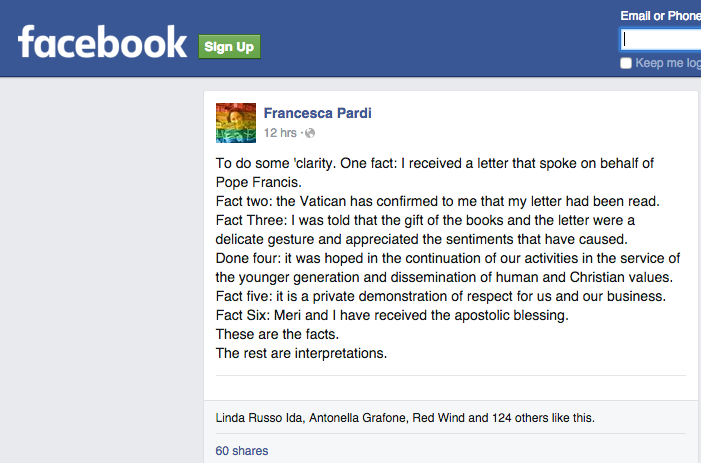 Through his staff, Francis wrote back some words of support for Pardi’s work. “His holiness is grateful for the thoughtful gesture and for the feelings which it evoked, hoping for an always more fruitful activity in the service of young generations and the spread of genuine human and Christian values,” a senior Vatican official wrote, according to the letter obtained by The Guardian. 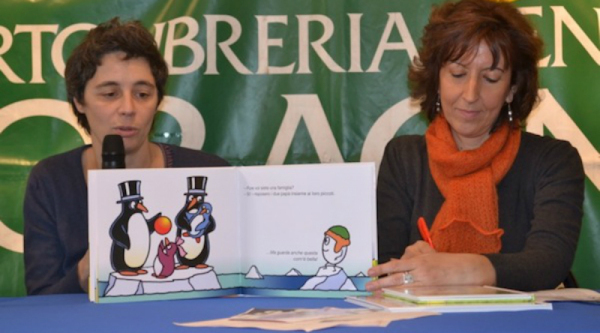 While the “genuine human and Christian values” mentioned in the letter are vague, the sentiment of the note is a far cry from that of Venice’s mayor, who has said the books about LGBT families are not appropriate for young kids. 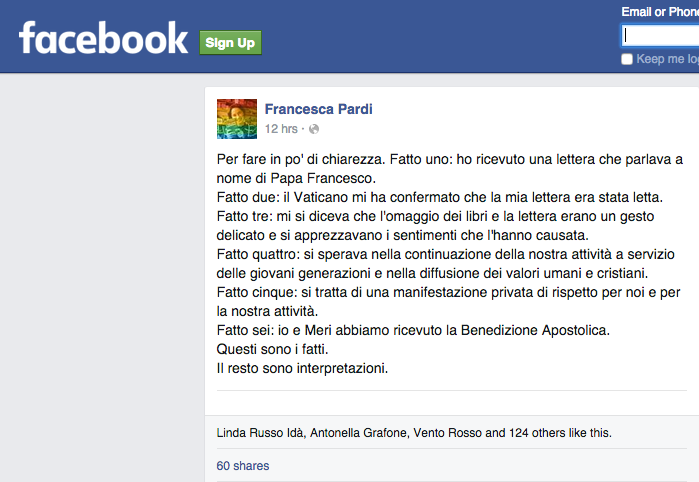 The Vatican clarified, however, that the blessings in the letter were personal praise for Pardi, and did not indicate support for views that go against Catholic teachings on gender and sexuality, according to The Guardian. Are these some of the “genuine human and Christian values” Francis is grateful for? 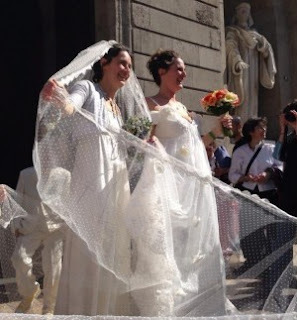 Maria Silvia Fiengo e Francesca Pardi after their April 2013 "wedding". 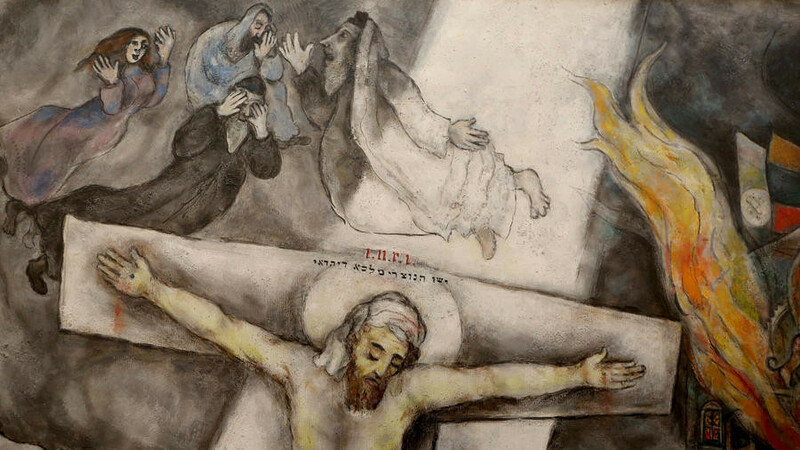 The inscription above the head in Chagall's blasphemous painting is Jesus' name misspelled in Hebrew which doubles as the rabbinic acronym "May his name and his memory be wiped out". Marc Chagall's blasphemous painting, "The White Crucifixion", which depicts Jesus the Christ not as the messiah but instead as Jesus 'Hasidic' Christ is being loaned by the Art Institute of Chicago to the Palazzo Strozzi in Florence, Italy. This piece of alchemical garbage will be part of an exhibition titled, Divine Beauty: From Van Gogh to Chagall and Fontana. The exhibition will start 24 September 2015 and finish 24 January 2016. Francis will finally get to view his favorite work of art in the flesh for the first time between the 9th & 13th of November when he will be in Florence attending the Fifth National Bishops Conference. 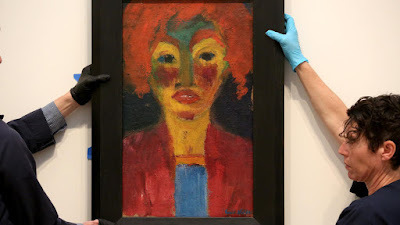 The Art Institute of Chicago replaced "The White Crucifixion" temporarily with an ugly painting called the "Red-Haired Girl" by Emil Nolde. Even though it's ugly it is a tremendous improvement as it isn't an affront to God. 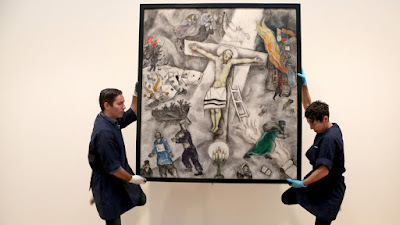 For readers not familiar with Chagall's Hasidic Golem Jesus, see the links below the photos which discuss it in detail. Off the wall it goes. 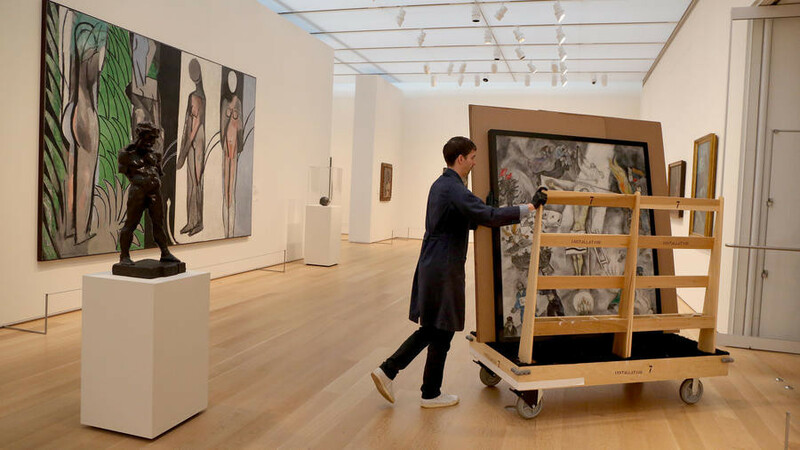 It's going to see the modernist, Francis 'the Humble'. 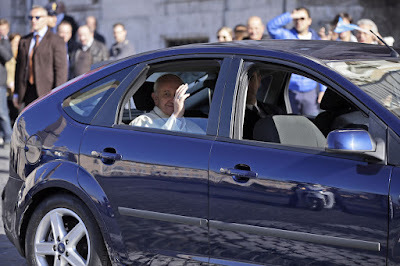 The newest popemobile will not be unveiled until Francis arrives in the United States of America. It is currently being made bullet-proof at the hands of the Secret Service and is rumored to resemble the Jeep (shown above), Francis used while in Ecuador. According to the USA Today article, Pope Francis' popemobile is Jeep Wrangler for U.S. visit, Francis will be riding around in a Jeep Wrangler showing off his rugged style. What a metaphor for Francis' papal reign. This latest piece of junk manufactured by the Fiat (Fix It Again Tony!) corporation will be a complete fabrication of what it is supposed to be just like Francis is. It's a fitting tribute to a man who spouts off "pub theology" while the world goes to waste. Yes sir, Francis should be mighty proud of his rugged personality, and lack of accomplishments thereof. Thanks to Call Me Jorge... reader, Frank Morrissey for sending us this story. 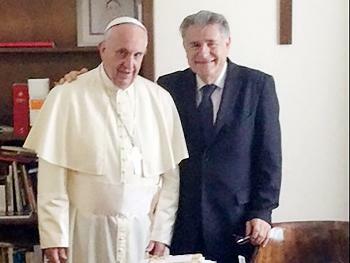 "“Where’s my briefcase?” asked Pope Francis. The papal entourage had arrived at Fiumicino Airport in Rome for the pontiff’s first trip abroad. Jorge Mario Bergoglio had been pope for just four months and was now bound for Rio de Janeiro, where 3.5 million young people from 178 countries were waiting to greet him at World Youth Day in Brazil. And he could not find his briefcase. “It’s been taken on board the plane,” an aide explained. “But I want to carry it on,” said the pontiff. “No need, it’s on already,” the assistant replied. 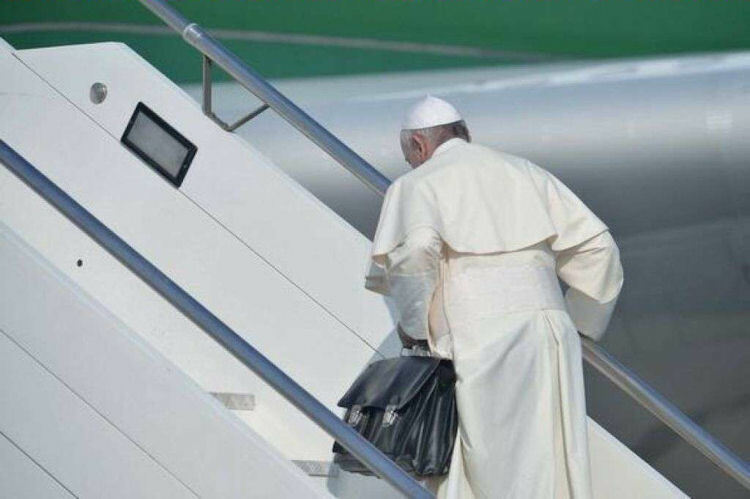 Members of the press, who were already waiting on the plane, soon saw from their windows that Pope Francis was moving purposefully through a crowd of functionaries to the aircraft, carrying a black briefcase in his left hand. This was a story: Popes had never before carried their own luggage." "It’s a new normal: Francis has presented himself to the world as an icon of simplicity and humility, eschewing papal limousines and the grand Apostolic Palace, and instead being driven in a Ford Focus and living in the Vatican guesthouse. But being simple can be a complex business if you are the leader of one of the world’s largest religious denominations and also a head of state. And Francis’s life story shows that humility is not an innate quality of his, but a calculated religious, and sometimes political, choice." 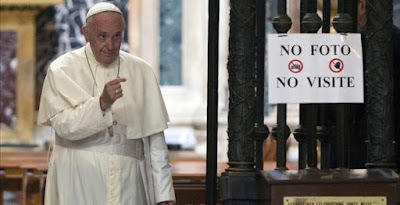 "By his own admission Bergoglio was a political animal. As a teenager he had been interested in the relationship between faith and communism." By the time he was sent into exile, according to one senior Jesuit in Rome, around two-thirds of Argentina’s Jesuits had lost patience with him." "But as a bishop and archbishop he embraced many of the central doctrines of Liberation Theology—on poverty, inequality, and economic justice—because they fit his changed priorities. 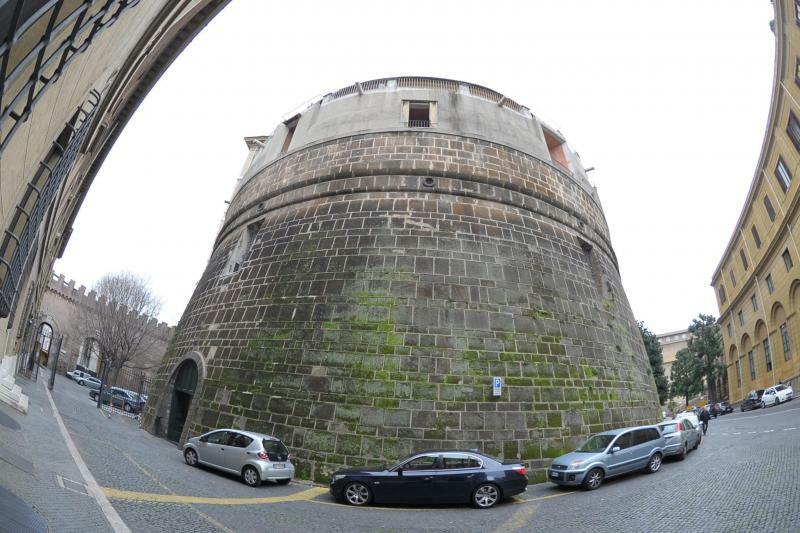 As Francis settled into the early months of his papacy, big gestures like moving to live in two rooms in a Vatican hostel surprised and even shocked people. But it has since become clear that the gestures are not spontaneous or random responses to situations in which he happens to find himself. They are being planned to set out what is in effect the program of his papacy. Some are directed to the world and draw the attention of the media, but others are aimed at the clerical establishment and at the ordinary faithful." Fittingly Francis has the global technocracy, he is always harping on about, running the Vatican Bank. "When it comes to the global superpowers of finance Pope Francis is splitting himself in two. On the one hand he flogs them relentlessly, as he did in the encyclical “Laudato Si’,” although always in generic form so that one is never able to tell whether his ax also falls on Mario Draghi and the European Bank, Christine Lagarde and the Monetary Fund, Janet Yellen and the Federal Reserve. On the other hand he has called in none other than the upper crust of the global technocracy to bring order to the Vatican’s disastrous finances, starting with the IOR, the Institute for Works of Religion, which is now the de facto charge of the Washington-based Promontory Financial Group." Does Francis ever listen to his own words? Here's the devotion Francis helped invent and which he has pushed since he saw a painting in the church of St. Peter am Perlach located in Augsburg, Bavaria, Germany during his studies for his never completed doctoral thesis on Romano Guardini. God willing in the future, Call Me Jorge... will have more on the subject of Mary Untier of Knots. 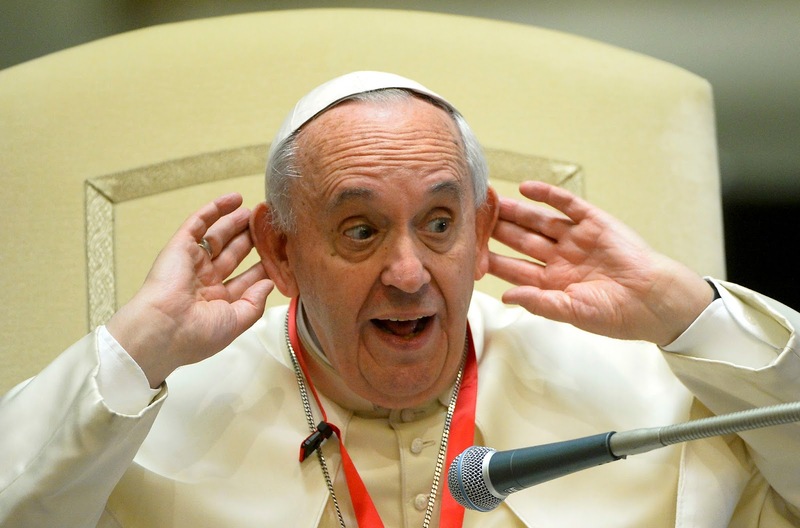 Francis, how much of that profit was generated by usury? When did the Church ever say divorced people were excommunicated? "Let special care be taken that the people be well instructed in the precepts of Christian wisdom, so that they may always remember that marriage was not instituted by the will of man, but, from the very beginning, by the authority and command of God; that it does not admit of plurality of wives or husbands; that Christ, the Author of the New Covenant, raised it from a rite of nature to be a sacrament, and gave to His Church legislative and judicial power with regard to the bond of union. On this point the very greatest care must be taken to instruct them, lest their minds should be led into error by the unsound conclusions of adversaries who desire that the Church should be deprived of that power." Q. 1023. Can the bond of Christian marriage be dissolved by any human power? Q. 1024. Does not a divorce granted by courts of justice break the bond of marriage? A. Divorce granted by courts of justice or by any human power does not break the bond of marriage, and one who makes use of such a divorce to marry again while the former husband or wife lives commits a sacrilege and lives in the sin of adultery. A civil divorce may give a sufficient reason for the persons to live apart and it may determine their rights with regard to support, the control of the children and other temporal things, but it has no effect whatever upon the bond and spiritual nature of the Sacrament. Q. 1025. Does not the Church sometimes allow husband and wife to separate and live apart? A. The Church sometimes, for very good reasons, does allow husband and wife to separate and live apart; but that is not dissolving the bond of marriage, or divorce as it is called, for though separated they are still husband and wife, and neither can marry again till the other dies. Q. 1026. Has not the Church sometimes allowed Catholics once married to separate and marry again? A. The Church has never allowed Catholics once really married to separate and marry again, but it has sometimes declared persons apparently married free to marry again, because their first marriage was null; that is, no marriage on account of some impediment not discovered till after the ceremony. Q. 1027. What evils follow divorce so commonly claimed by those outside the true Church and granted by civil authority? The loss of the true idea of home and family followed by bad morals and sinful living. Q. 1042. Why should Catholics avoid mixed marriages? Because the one not a Catholic, disregarding the sacred character of the Sacrament, may claim a divorce and marry again, leaving the Catholic married and abandoned. "He concludes the interview on a question about the controversial Society of Saint Pius X (SSPX). Carefully handling the subject, he chooses to focus on the positive elements to be found in the society, expressing hope that they can be brought back into full communion with the Church — a status they don't currently enjoy. Offering his take on how to best tackle the task of reconciling the society with the Church, Bp. Schneider believes both sides are overestimating the importance of Vatican II." Capture of the text from Church Militant website. ...When the SSPX believes, worship and conducts a moral [life] as it was demanded and recognized by the Supreme Magisterium and was observed universally in the Church during a centuries long period and when the SSPX recognizes the legitimacy of the Pope and the diocesan bishops and prays for them publicly and recognizes also the validity of the sacraments according to the editio typica of the new liturgical books, this should suffice for a canonical recognition of the SSPX on behalf of the Holy See. Otherwise the often repeated pastoral and ecumenical openness in the Church of our days will manifestly lose its credibility and the history will one day reproach to the ecclesiastical authorities of our days that they have “laid on the brothers greater burden than required” (cf. Acts 15:28), which is contrary to the pastoral method of the Apostles." Click here to read full interview with Athanasius Schneider. Did you see the word "hope" once in Schneider's words? No, well neither did we! After 'misreporting' about Schneider, Mr. Fitzgerald mentions Bishop Robert Morlin (the bishop of the irreverent and immoral priest Fr. Z) who is "a favorite among traditional Catholics" and who said of the FSSPX, "have nothing to do with them." What does this have to do with Schneider's interview? Did Ryan Fitzgerald read the entire interview? Is he hoping Church Militant readers don't click on the link and read the entire interview? Was Mr. Fitzgerald trying to toe the company line? Or was he ordered by his boss at Church Militant to misreport? Is he trying to prejudice the reader with the Church Militant interpretation in mind? 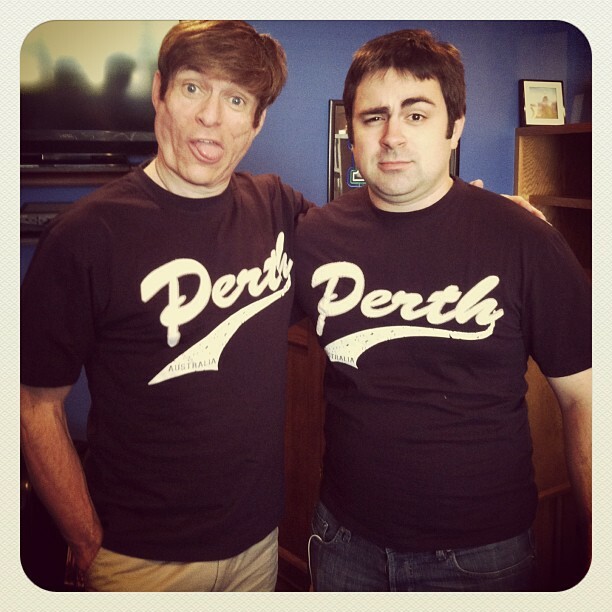 Or did Ryan overdose on the new Vortex coffee? 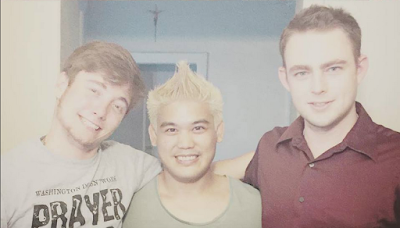 and Ryan Fitzgerald celebrate Anthony's birthday. Michael Voris has issued a clarification on the words of the false conservative, Athanasius Schneider, which includes a private email exchanged between the two. Voris still hasn't explained why his organization misreported the events. Two peas in a Talmudic pod. This year marks the 50th anniversary of Nostra Aetate, the Conciliar Declaration on the Church’s relationship with non-Christian Religions, which marked an important moment in ecumenical and interreligious dialogue and, in particular, with the Jewish world. To celebrate this anniversary, the annual conference of the International Council of Christians and Jews was held in Rome this summer, and had the joyful opportunity of having an audience with Pope Francis, where he stated that “an authentic fraternal dialogue has been made possible since the Second Vatican Council, following the promulgation of the DeclarationNostra Aetate. This document represents a definitive ‘yes’ to the Jewish roots of Christianity and an irrevocable ‘no’ to anti-Semitism. 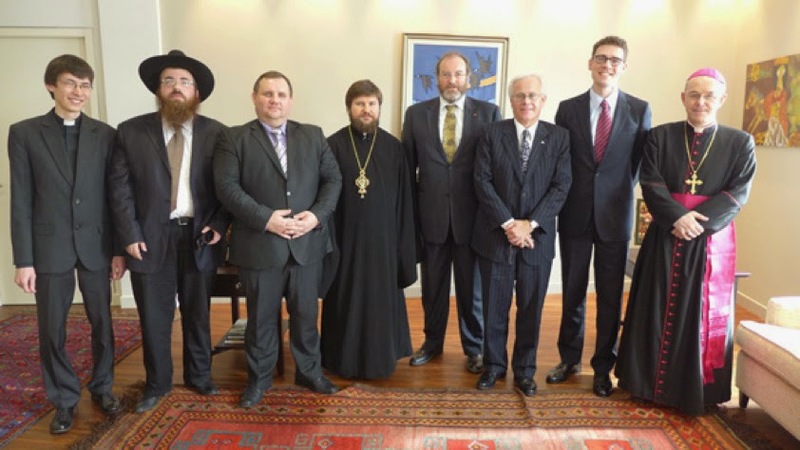 In celebrating the fiftieth anniversary of Nostra Aetate, we are able to see the rich fruits which it has brought about and to gratefully appraise Jewish-Catholic dialogue.” Among those who participated in the conference was the Argentinean Rabbi Abraham Skorka, who was first in line to greet his friend Jorge Mario Bergoglio, and who later granted us an interview. More than a year has passed since your historical pilgrimage with Pope Francis to the Holy Land. Would you like to share with us why you chose to join him on that trip, and why it was important? The Holy Land was one of the topics that we often analyzed together, also in our book. The main question was this: what can we do in order to promote peace in the Middle East, and specifically in the Holy Land? For me the State of Israel is a very important theme: a state which has the challenge of showing the development of Jewish culture in our present day. The Zionist Movement is not merely a movement that claims and proclaims the re-establishment of the Jews in the Land of Israel. It is also a cultural movement, which helped to transform Hebrew into a living language, and that voices concern over the future of the Jewish culture. With regards to “Rome” and “Jerusalem”, there is an historical antagonism between Rome and Jerusalem which is also mentioned in the Talmud. Rome destroyed the province of Yehuda during the terrible war between 67 and 70 which ended with the destruction of the temple of Jerusalem. In 73 there was the siege of Masada and then, from 132 to 135, there was the terrible war was carried out by Adrianus. What we tried to do through this pilgrimage to the Holy Land was to transmit a message of peace, and to express our hope that the gap produced by over 2,000 years of conflict may be filled with sentiments of pureness, love, thus giving the possibility to see one another as brothers in our human condition. From another angle, the idea was to go to the place to which I direct my tefilot (prayers) and to the place where Jesus – who is so special to the Christian faith – was born, lived, and spread his message. It is a special common place for us, and when I saw Pope Francis after he was elected, I told him: Let us go to Israel. This is the place in which our religiosity, our vision of God, and our connection with God was established. We are the children, the descendants of the great prophets who elevated their prophecies in Jerusalem. 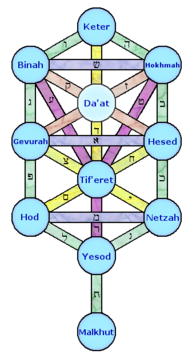 We had our good friend Omar Abboud with us in order to show that all Abrahamic religions must embrace each other, forming a circle of spiritual power which, according to our Holy Scriptures, will bring peace to our world. This is our challenge and this was the reason for our journey, which was not a trip, but rather a pilgrimage. You have spoken about the importance of the place in itself, of Jerusalem, and also of the global message one should spread. You, Pope Francis and Omar Abboud you are not originally from the Holy Land, nor are you living there. What do you think that the Order of the Holy Sepulchre, which has more than 30,000 members around the world, can do in those places where it is located in order to promote encounter and peace? One could define our pilgrimage as a proclamation for peace sent out from the very place from which Isaiah said: “For out of Zion shall go forth the Torah [instruction, in the NRSV translation] and the word of the Lord from Jerusalem.” (Is 2:3) What does the Torah mean? Peace! This verse comes from the middle of a description of a reality of peace in which one people will not lift up sword against the other, and in which swords will be transformed into plowshares. We have received this idea, but how can we pragmatise it around the world? Every Christian community and every Jewish community ought to have interreligious programs. The first step for these interreligious programs must be an encounter between Jews and Christians of different denominations, to see and to know each other, and to analyze themes together. 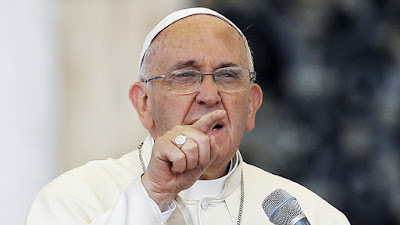 Of course there should not be an analysis of very sensitive topics at the very beginning, but instead daily problems should be analyzed from Jewish and Christian points of view, and then studied together, as Pope Francis suggested in Evangelii Gaudium. This should be the beginning: to know each other and to work together in order to solve the problems that affect our common society. Would you like to conclude by sharing a prayer that you think can be helpful for sustaining peace in the Holy Land? All our prayers quote different Bible verses. A few passages from the book of Isaiah come to mind. In Isaiah Chapter 2 there is the famous image of a Jerusalem of peace. Peace is what we must ask God for: to bless us (and I mean Jews, Muslims and Christians) in order to help us accept one another with great respect, to see one another as brothers. It is then that we will surely be able to build up a Jerusalem of peace in which all of us will have the possibility to express the best sentiments, ideas and thoughts which are in each one of us. The other passage in Isaiah, which strikes me as a tefila, a prayer, is at the end of Chapter 19, where there appears to come a way that connects Egypt and Assyria, and then “Israel will be the third, along with Egypt and Assyria, a blessing on the earth. God will bless them, saying, ‘Blessed be Egypt my people, Assyria my handiwork, and Israel my inheritance.’” (Is 19:24-25) At that time, I understood, I pray, all people will have a deep commitment to worship God and it will be a blessing for the whole world. The third passage in Isaiah, which is very relevant for me as a prayer, is the one that says “for my house shall be called a house of prayer for all peoples” (Is 56:7). He will bless us, all of us, with greatness to transform all the city of Jerusalem into God’s house. Not because God is living in this house, but in order that each person who comes to Jerusalem, no matter what his or her faith may be, will have the possibility of finding in Jerusalem a real dimension of spirituality. In this way we will really honor the memory of the prophets of Israel, the great masters of Israel, Jesus, and Muhammad. We hope to soon have a longer post on this exhibit and the history of Saint John Paul II kotowing to his "elder brothers". 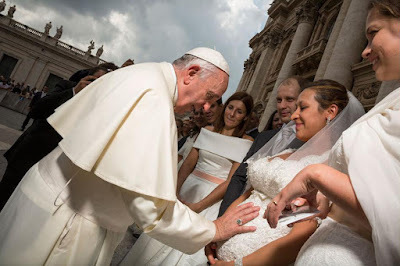 Francis appears to need a remedial course on Marylike standards of dress. Doesn't he understand one of the contributing factors to the women ending up pregnant before they married was their manner of dressing immodestly? Maybe he could visit Bp. 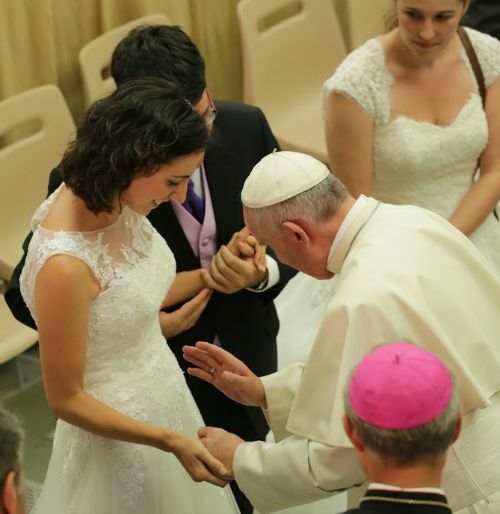 Fellay of the FSSPX, we hear he is teaching a class on Catholic modesty. 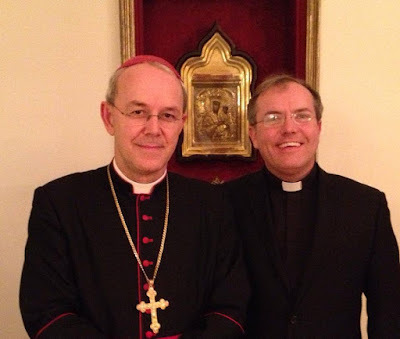 "While we were in Rome last month, we had the opportunity to sit down with one of the most faithful bishops in the world — Bishop Athanasius Schneider. He has made a point of traveling the world and insisting on fidelity to Church teachings. And he isn’t afraid to call out problems and speak to the severe consequences that flow from a lack of fidelity." source: The Vortex, What Are They Afraid of? ...When the SSPX believes, worship and conducts a moral [life] as it was demanded and recognized by the Supreme Magisterium and was observed universally in the Church during a centuries long period and when the SSPX recognizes the legitimacy of the Pope and the diocesan bishops and prays for them publicly and recognizes also the validity of the sacraments according to the editio typica of the new liturgical books, this should suffice for a canonical recognition of the SSPX on behalf of the Holy See. Otherwise the often repeated pastoral and ecumenical openness in the Church of our days will manifestly lose its credibility and the history will one day reproach to the ecclesiastical authorities of our days that they have “laid on the brothers greater burden than required” (cf. Acts 15:28), which is contrary to the pastoral method of the Apostles. Read the rest of the excellency interview here (for English, scroll to the end of the Spanish language version). source: Rorate Caeli, Bishop Athanasius Schneider: "there are no weighty reasons in order to deny the clergy and faithful of the SSPX the official canonical recognition"
Here we have Michael Voris of Church Militant/The Vortex extolling Bishop Anthanasius Schneider as a stickler for fidelity to Church teachings. Next, a video clip of Voris attacking the FSSPX. It was only back in 2012 when Mr. Voris had Louie Verrecchio on to talk about the FSSPX on his show Catholic Forum. What happened? Mike ran out of money for his Real Catholic TV (which later was re-branded Church Militant) and in stepped Terry Carroll to save the day. Plus a clown named Paul Nicholson, who is an Opus Dei affiliated priest, lends Mike spiritual support. And then today Rorate Caeli publishes their interview with Schneider and he says the FSSPX should be given "official canonical recognition, meanwhile they should be accepted as they are." Remember this is the same Schneider who is a false conservative who participates in interreligous dialogue but Mr. Voris extols! What's next Mike? Will it be another purge of videos from your website? Is Schneider now persona non grata at Church Militant? The above mentioned Athanasius Schneider and Paul Nicholson. Ever wonder where Francis' doctrine of 'mercy' comes from? Has the cat got your tongue today Mike? *Amazing Grace was written by John Newton who was a slave trader, a tax collector, an Anglican priest, a husband, a writer, an abolitionist, and a hymnist among many things. 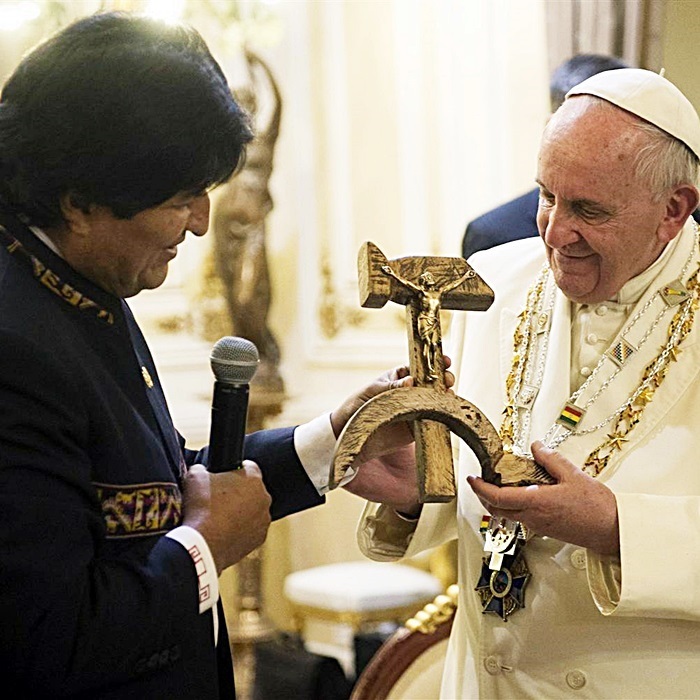 Francis is a righteous brother and a good noahide! Be a ger toshav just like Francis!